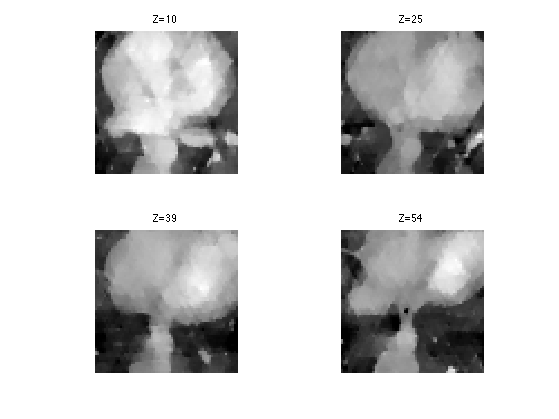 This numerical tour explores the reconstruction from 3D tomographic measurement with TV regularization. You need to download the following files: signal toolbox and general toolbox. You need to unzip these toolboxes in your working directory, so that you have toolbox_signal and toolbox_general in your directory. 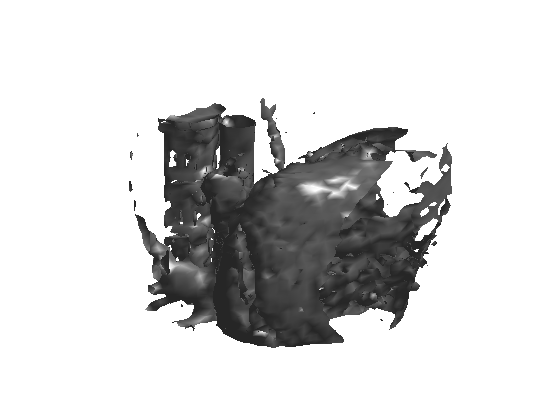 We load a volumetric data. % size of the image (here it is a cube). We can display some horizontal slices. 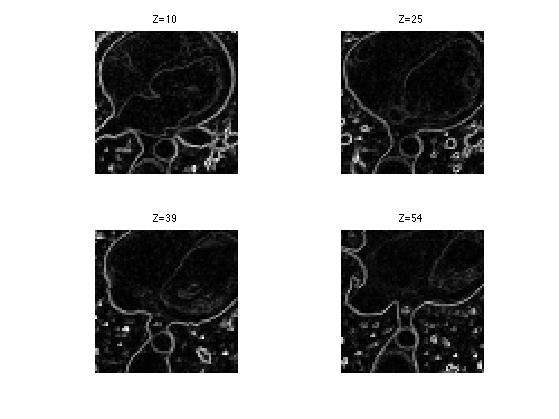 We can display an isosurface of the dataset (here we sub-sample to speed up the computation). 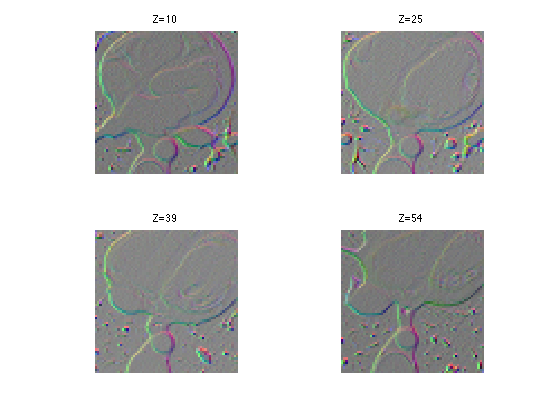 Tomographic measurements corresponds to the computation of orthogonal projections (integration along liners) of the 3D datasets on set of 2D planes. Thanks to the Fourier-slice theorem, this is equivalent to performing a sub-sampling of the 3D Fourier transform along planes (orthogonal to the projection directions). Either uniform sampling for P==12, or randomized projection directions, on the sphere. Display the directions on the sphere. 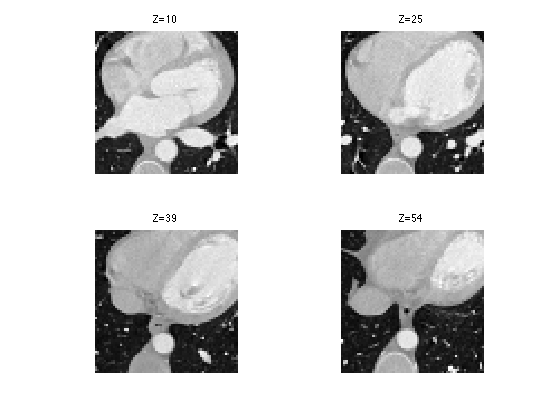 Tomographic measurement can thus be intepreted as a selection of a few Fourier frequencies. The transposed operator corresponds to the pseudo inverse reconstruction (because the measurement operator is in fact an orthogonal projection). It is similar to the filtered back-projection (excepted that the Fourier sub-sampling is now on a discrete grid, which is not really faithful to the geometry of tomographic acquisition). SNR of the pseudo inverse reconstruction. Since medical images often have a cartoon morphology, it makes sense to perform the reconstruction while minimizing the TV norm of the image. To be able to use a gradient descent for the reconstruction, we use a smoothed TV-norm, using a smoothing parameter epsilon. The smaller, the closer to TV, but the slower the method is. The gradient of the volum is a 3D vector field, and hence a (n,n,n,3) matrix. Display the gradient as a color image. Compute the smoothed norm of the gradient. 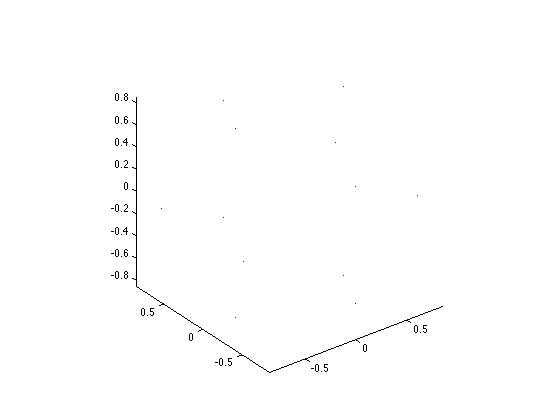 This corresponds to a edge detector. Compute the regularized TV norm. We perform the reconstruction using a projected gradient descent. Gradient descent step. Should be proportional to epsilon. 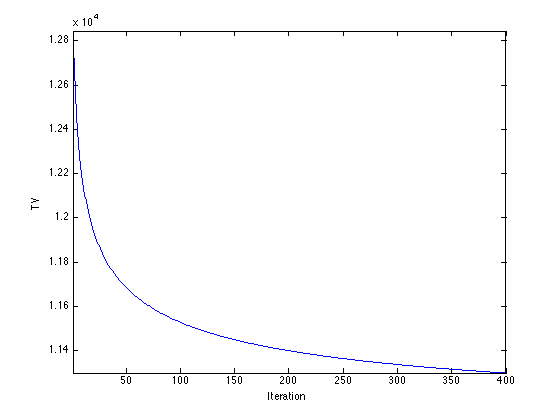 Initialize the solution using the pseudo inverse. 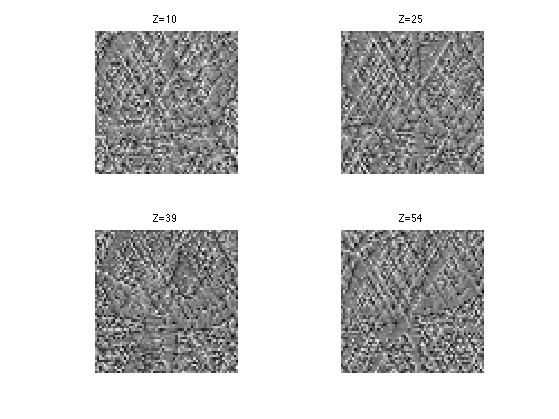 The gradient of the smoothed total variation is minus the divergence of the normalized gradient of the image. Perform the projection step to impose the known values. Exercice 1: (check the solution) Perform the projected TV gradient desent, and monitor the epsilon-TV norm during the iterations. SNR of the resulting reconstruction.